You are here: Home / Documentation / FAQ / How is air pollution in Brussels, in comparison with other European cities? In large agglomerations like Paris, Berlin or Milan, the yearly limit value for NO2 is still being exceeded on locations with a lot of traffic, just as in Brussels. The highest concentrations of particulate matter are measured in East-European countries, because coal still is a major source for heating and power generation there. 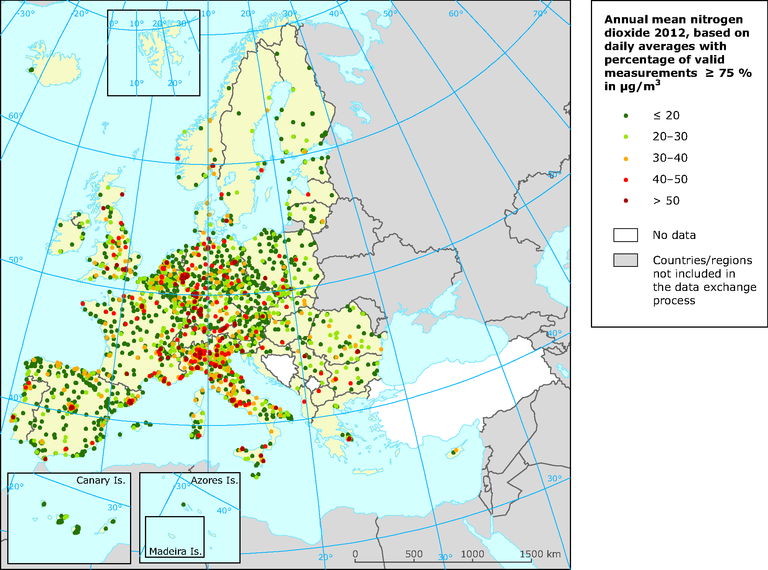 On a map of the concentrations of nitrogen dioxide throughout Europe, Brussels and Antwerp are clearly recognisable as red dots, just like Paris, London and Amsterdam and the cities in North-Italy. More information can be found in the annual report on air quality of the European Environment Agency.